The February 2018 Costco Coupon Book will run from February 8th through March 4th. This means there will be 1.5 weeks between the January 2018 Costco Coupon Book and the February one. There will also be 1.5 weeks between the February coupon book and the March coupon book. The Super Bowl Savings Book will fill in some of that 1.5 week gap between January and February, although it’s exclusively electronics and appliances. You can also take a look at the February 2017 Costco Coupon Book to get an idea of what might be on sale in this years booklet. We know of a few items in the February 2018 Costco Coupon Book. 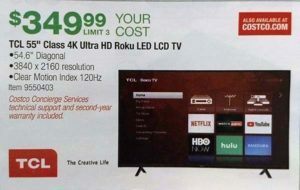 First of all, there’s the 55″ TCL 55S403 4K UHD HDR Roku Smart LED HDTV on sale for $350. This is a good deal. Another item that will be on sale and stands out as a good deal is a Lorex 8CH 4K HD NVR 6 Bullet Camera Security System 2TB for $699, which is regularly $799. The tire coupon will also be Michelin once again. We’ll be posting the rest of the deals soon, so keep an eye out for that! This looks like a not so subtle way for Costco to “raise” prices – limiting the time their coupons are valid by a significant amount. I think they just want to postpone regular traffic in the stores, specifically this weekend due to the Super Bowl. Not having an currently running ad is making me postpone my trip there. However the other people that will go in place of me for SB stuff will fill their stores as it is, without a current ad. I can never get the coupon book open even clicking on all the links.